You know I love a new source, so I was excited to learn that two of my go to brands were pairing up to offer you all some amazing artwork with some amazing framing! AllModern + Framebridge have paired up to create a great collection of prints from some of your favorite artists. Each print comes in multiple sizes and has different frames available for each. Framebridge has been my favorite framing company for a while now because of their attention to detail and quality of frames (and hanging hardware!!) So I knew that with this collaboration with AllModern I could expect the same. 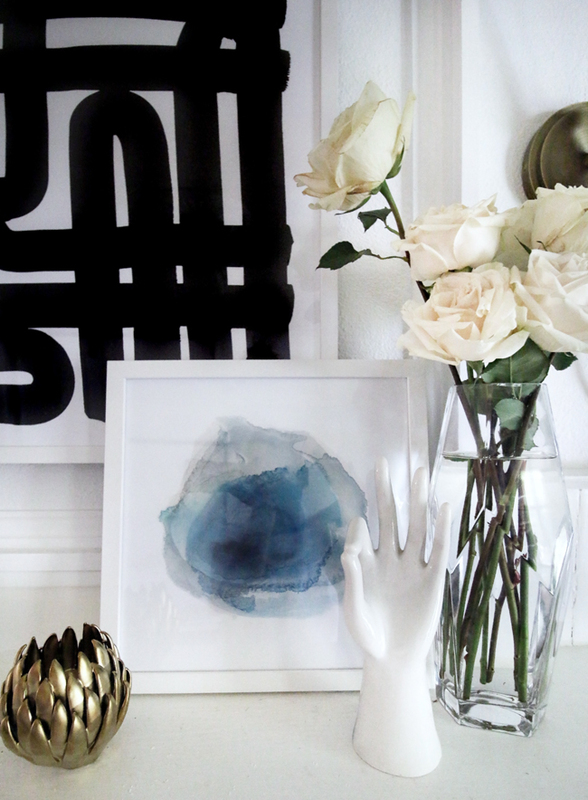 The large black and white graphic print is by one of my favorite artists, Kate Roebuck. I most recently used one of her pieces over at #ProjectFamJam, remember the Hahahaha artwork?! Same artist. So I was excited to see her works within the collection. 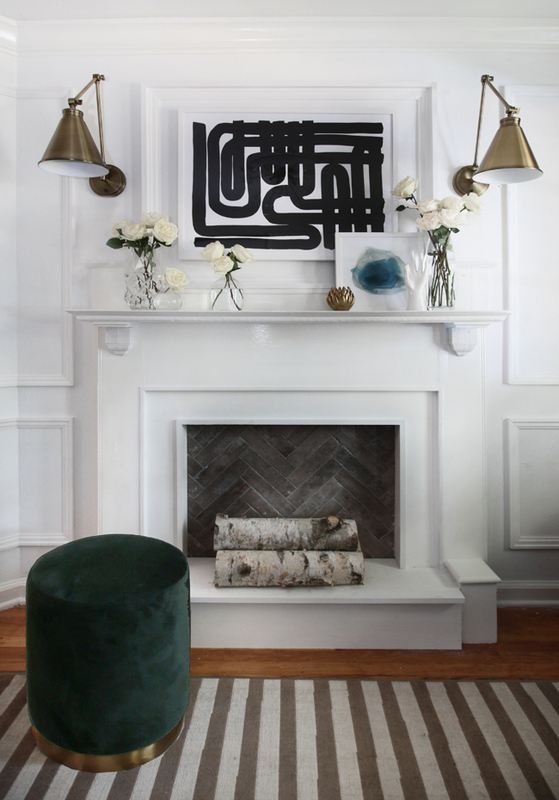 You know I love pairing modern and traditional, so this abstract print on top of the classic mantel pulls at my heartstrings. I also layered in this watercolor print by Michelle Armas. The smokey grays and dusty blues go well with the blue accents in the space. When choosing the new artwork I knew I wanted to have them compliment the original artwork in the space, and not have them compete. I think this important when creating an artwork story within a room or home. You want each piece to be able to have their own moment. My original abstract, by Gee Gee Collins, already had watercolor pops of color so pairing it with the graphic black and white was a nice juxtaposition. And the tones and watercolor effect on the smaller piece complimented them both, without trying to steal the show. The fireplace transformation occurred thanks to a few pieces of basic trim work, some paint and this great elongated brick tile. The taupey tones of the brick tied into the area rug and the herringbone pattern I used relates back to our kitchen backsplash. It was my first time attempting tile and of course I choose one of the hardest patterns, lol, but I am so happy with the results. 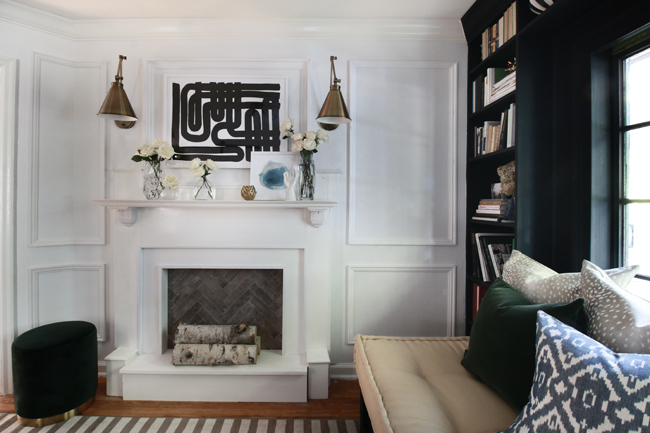 The brick paired with the new hearth really upgraded the appearance of our vintage mantel. As well as the addition of the birch logs. I am on the hunt now for some vintage andirons, so if you see any great ones, be sure to let me know!! Thanks Suzanne! The entire room has Picture Moulding as “frames” on the wall. My walls are textured as well in here. I had gone back and forth about scraping them down and refinishing, but that just wasn’t feasible for us at the moment. The trim really helps to distract from the texture. Hope this helps! Truly gorgeous! 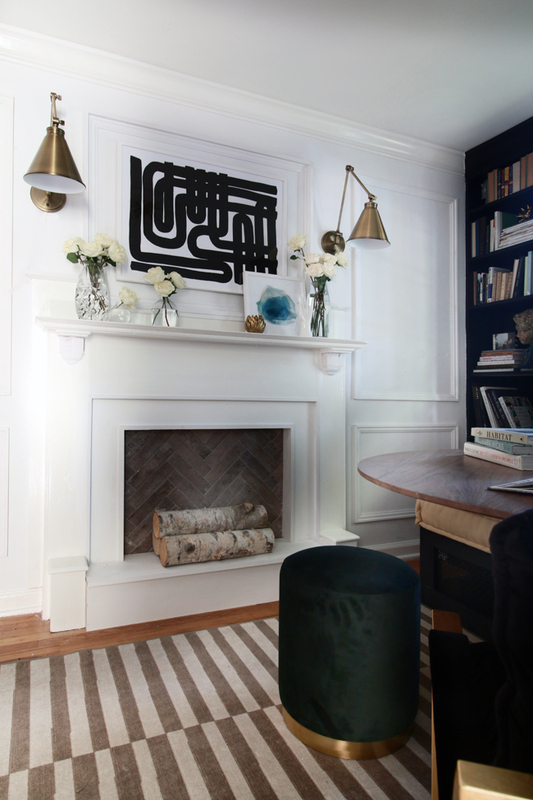 I love the elements of gold that tie the entire room together! And that green gold ottoman is heavenly! Simple Finds on Chamblee Dunwoody had an awesome set of brass andirons two weekends ago. I don’t remember which booth they were in. This particular set may be too large though. The size of the andirons is what caught my attention.